Dog parasites can be more than just an inconvenience. While the summer season brings plenty of great opportunities to spend quality outdoor time with your furry friend, it is also a time when dog owners have to be more vigilant and make sure their dogs are staying clear of harmful parasites. 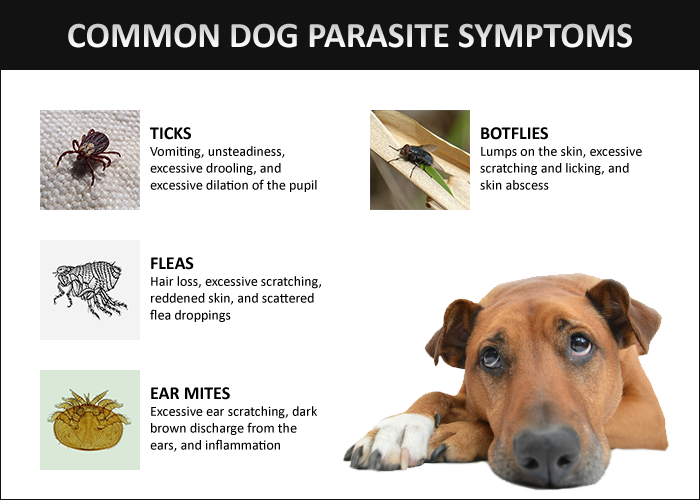 Get in the habit of examining your dog on a regular basis for the following parasites. These blood-sucking parasites can be harmful to dogs (and to you as well) because some may transmit dangerous diseases like Lyme disease. Ticks are commonly found in tall grass or wooded areas. They climb and attach themselves when the dogs move through the grass. It's not easy to identify ticks because they are so small. A nymph, for example, is only 1-2mm long. A dog affected by ticks may display symptoms such as vomiting, unsteadiness, excessive drooling, and excessive dilation of the pupil. When examining your dog for ticks, make sure to put on disposable medical gloves to avoid direct contact with the parasite. You'll most likely feel a bump or some swelling if ticks are present. A visit to the vet is highly recommended but you can take the initial step of removing any visible ticks by using blunt-end tweezers. Create your own tick repellent by combining twenty drops of Rose Geranium essential oil and two tablespoons of almond oil. Apply a few drops of the resulting mixture on your dog and on the collar. This remedy should be used for dogs only. The good old fleas are never too far away from irritating your dogs. Unlike the ticks, fleas don't necessarily have to wait for the hosts to come to them. Fleas instead can move long distances. Did you know that fleas have the ability to jump up to 10,000 times in a row to find a suitable host? Common symptoms of flea infestations may include hair loss, excessive scratching, and reddened skin. If you have a dog with medium to long hair, then consider getting a flea comb. These combs are specifically designed to remove fleas and flea eggs from deep within the fur. Comb out as many of the fleas as you can then apply the appropriate treatment (e.g. regular flea shampoo sessions) to prevent future flea infestations. Gently rub a bit of food-grade diatomaceous earth on your dog's fur and on your dog's bed. Diatomaceous earth is a natural substance that could kill fleas by piercing their exoskeleton. This causes dehydration and eventually leads to the flea's death. Ear mites require professional care because they are not visible to the naked eye. Ear mites are highly contagious and can be easily passed on by physical contact. Dogs affected by ear mites exhibit symptoms such as excessive ear scratching, dark brown discharge from the ears, and inflammation. Ear mite infestations should be treated as soon as they are identified. When left untreated, ear mites may cause serious damage to a dog's ear canal and affect their hearing ability. Combine one part vinegar with two part water. Gently pour or spray the vinegar solution into your dog's ear. This treatment should only be used if there are no open wounds in the dog's ear. Dogs with sensitive ears may experience some discomfort with vinegar so start off small. Botflies are one of the last things you want to see appearing on your dog's body. Botfly infestations are seasonal and occur most often at the end of summer. Much like ticks, botflies hang around in grassy areas and crawl on once the dogs come into contact with the grass. Common symptoms of botfly infestations include lumps on the skin, excessive scratching and licking, and skin abscess. Dogs with botfly infestations should be taken to the vet. Removing botflies, especially if there are many of them, can be painful for your dog. Under some circumstances, vets may give dogs anesthetics to keep them relaxed during the operation. If there are only a few maggots and they are clearly visible and moving in the hole, then you could try removing them yourself by using blunt-end tweezers. Be sure to remove the maggot in one piece. Your dog could suffer from an inflammatory reaction if the maggots break into several pieces. Unfortunately, natural remedies don't work so well for botfly infestations so be sure to schedule a visit to the vet as soon as an infestation is identified. The last dog parasites to consider are hookworms, roundworms, tapeworms, and whipworms. Panacur (fenbendazole) helps treat these worms - I recommend getting this from Amazon! Sam is a gardening enthusiast who loves to learn and write about topics such as going green, conservation, and natural remedies.